Every year, businesses spend nearly $3.8 trillion on enterprise technology and services. Until now, though, they have had to decide what to buy based heavily on biased vendor sales pitches and marketing materials as well as software reviews by technology analysts, typically underwritten by the narrow subset of vendors being reviewed. 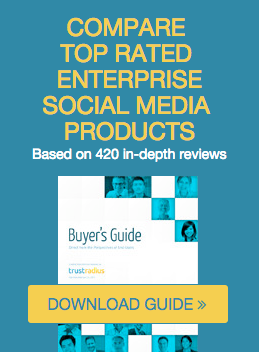 TrustRadius already features more than 250 in-depth, software reviews by authenticated users on 100 different marketing, sales, finance, HR and IT software products. Reviewers include a broad spectrum of users – front-line, mid-level managers to C-level executives – at all types of organizations, from start-ups to global industry leaders such as Dell and American Red Cross. The reviews not only provide buyers with intelligence to select the best solutions for them but also guidance on implementation and usage to maximize their return on investment. TrustRadius was founded in July 2012 by Vinay Bhagat and David Hart, Founder/Chief Strategy Officer and Chief Technology Officer, respectively, of Convio, widely recognized as the company that transformed the way nonprofits use the Internet to fundraise. After going public, Convio was acquired last May for $325 million. Bhagat, TrustRadius’ CEO, conceived the idea for TrustRadius after observing the challenges that Convio team members experienced when seeking authentic, comprehensive and unbiased information on technologies they were considering for purchase. A comprehensive product directory across categories. For example, for social media management software, TrustRadius currently features more than 70 products. By contrast, traditional technology analysts like Gartner and Forrester feature a much narrower subset. TrustRadius also makes it easy to comprehend in simple terms what a product does and other key information like which products integrate, competitive alternatives, etc. In-depth, vetted reviews. Reviewers answer up to 40 questions about their product experience, and a TrustRadius analyst checks every review for completeness and clarity prior to publication. Side-by-side comparisons. TrustRadius makes it easy to compare products, highlighting differences in average ratings and aggregating comments from multiple reviewers on topics such as what a product does well, weaknesses, customer service, implementation, etc. Trust Indicators. The TrustRadius community rates software reviews. Reviewers earn reputation points based on those ratings and build personal profiles, which demonstrate their expertise. TrustRadius is the leading website for professionals to share candid opinions on business technology products to help each other make the most informed decisions about which solutions to buy. The online community also provides guidance on implementation and usage decisions. Site members share real-world insights through in-depth software reviews, discussions and networking. TrustRadius was founded by proven, serial entrepreneurs renowned for disruptive technology innovation – Vinay Bhagat and Dave Hart, the Founder/Chief Strategy Officer and Chief Technology Officer, respectively, for Convio, which transformed the way nonprofits use the Internet for fundraising. To learn more, visit www.trustradius.com.